The 26B-SP blower is an entry level performance lef blower suitable for the homeowner wanting value for money. Comes complete with a Full Crank Euro 2 Engine. The Mitox 26B-SP handheld petrol blower is the entry level model in the range and offers great value for money. The 26B-SP leaf blower is powered by a 25.4cc 2-stroke petrol engine which generates a high blowing speed for optimum debris clearing efficiency whilst the throttle control function enables comfortable operation during periods of prolonged use. Included with the blower is a flat blowing tube making it ideal for clearing debris in a small focused areas within the garden. 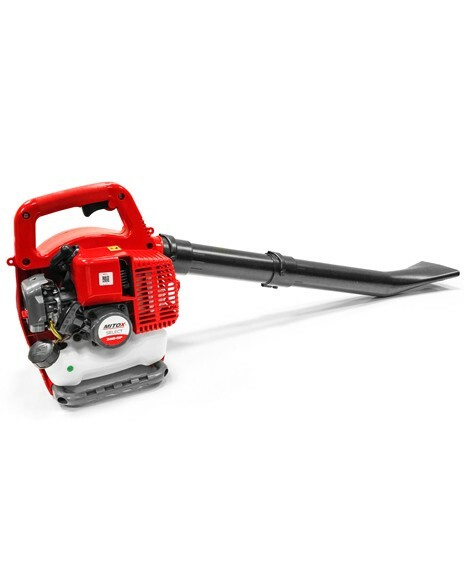 The blower is suitable for clearing fallen leaves, grass trimmings, light hedge cuttings or sawdust from around the garden making it a versatile machine for use all year round.